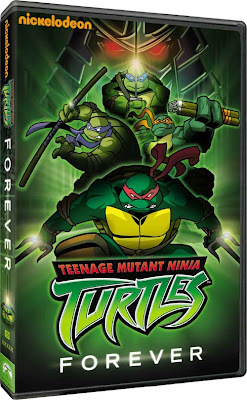 When "Turtles Forever" aired on TV last month, it was with about 12 minutes cut from the movie due to commercial breaks. Even though we are still waiting on news of a DVD release, you can now watch the movie in its entirety on the 4Kids website. Unfortunately, you'll have to watch the same "Princess and the Frog" video game commercial every five minutes or so, but hey, it's better than not seeing it at all. Click here to watch the uncut "Turtles Forever"! Set the alarm clock and prepare your VCRs or DVRs, tomorrow is the day you've been waiting for! "Turtles Forever" is scheduled to air at 10am on the CW4Kids. Be sure to check your local listings! Times and stations vary from market to market, and as this is a one-time-only event, you don't want to miss it! Check back tomorrow, as I will be recording it myself and will try to post some clips for everyone. Animatic Preview: First five minutes of the movie in animatic form. 1988 Shredder Animatic: Introduction of 1988 version of Shredder. Hun Animatic: Hun prepares to attack. Thanks to Master Splinter for putting it on YouTube! You can also check it out at 4Kids.tv. And be sure to check out the awesome wallpapers posted today at 4Kids.tv! Thanks to Turo602 for the heads-up that allowed me to record it! Courtesy of 4Kids and 4Kids.tv! Thanks to Javier E. and MuveePro.com! "Turtles Forever" to Air on CW4Kids Nov. 21 - ONE TIME ONLY! A representative for 4Kids has announced over at TheTechnodrome.com (and on 4Kids.tv) that "Turtles Forever" will air on CW4Kids, for one time only, on November 21. Surely, any future viewing would have to be on DVD. And as we have no idea what the status for a DVD release is, this is something you most definitely do not want to miss! So be sure to check your local listings and tune in November 21! 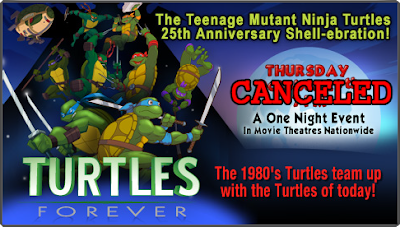 Less than a week after the event appeared on the Fathom Events Web site, the "Turtles Forever" one-night-only screenings have all been canceled. Unfortunately, 4Kids Entertainment and Mirage Studios were unable to reach an agreement with Fathom Entertainment to present the “Turtles Forever” special event. We will keep our Turtles fan base informed as we work on a new distribution plan for this exciting project. While the event was still listed on the Fathom Events site this morning, it has since been revised and now simply states, "Due to unforseen circumstances this event will not be shown in theatres." The TMNT25.com message, which refers to being unable to reach an agreement with Fathom Entertainment, is quite curious, as one usually assumes those kinds of details are already in place before the event gets listed on the site. On the bright side - without going into details - if there is any possibility of seeing this anywhere else this year this is the way it has to be. Lets hope 4Kids and Mirage have a kickass backup plan in mind, because missing out on the national exposure even a one-night-only event would give to the project for anything less than awesome would not only be a disappointment for fans, but a huge missed opportunity for the franchise as a whole. Reira on The Technodrome forums found the complete listing of participating theaters for the "Turtles Forever" screening event. 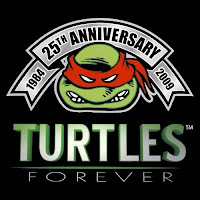 "Turtles Forever" Theater Screening Confirmed! The rumored theater screening of "Turtles Forever," reported yesterday, has now been confirmed. The Teenage Mutant Ninja Turtles from the 1980s meet the Turtles of the 21st Century in a dimension-hopping, action-packed, knee-slapping movie extravaganza! When the gigantic, evil, and terrifying Technodrome (a giant mobile battle station from the original 1988 TMNT animated series) suddenly appears in our world, carrying with it the original 1988 series Ninja Turtles, our world’s Leonardo, Raphael, Donatello and Michelangelo find themselves with a huge mystery to solve and four crazy Turtles to babysit! Can the Turtles of the past and the Turtles of the present stop annoying each other long enough to stop all of time and space from unraveling? It’s a ninja tag-team extraordinaire across multiple dimensions, full of twists, turns and more Ninja Turtles than you have ever seen anywhere before. It is a must-see special event for the millions of Turtles fans everywhere and the perfect 25th anniversary celebration for the Teenage Mutant Ninja Turtles. The feature will be followed by a rare look behind the scenes with Ninja Turtles co-creator Peter Laird, created exclusively for this very special event. Learn how the Teenage Mutant Ninja Turtles came to be – their Secret Origin. Through rare original comic book art, archival pictures and all-new interviews, Pete tells how he and co-creator Kevin Eastman came up with this crazy idea in the first place as well as highlights over the past 25 years of the biggest Turtle moments of all time. tone-master21 also found this link with participating theaters. The date for these showings is listed as October 22nd, so it seems that not all showings will be on the same day. Better start checking your local listings! A little birdie has suggested to me that "Turtles Forever" may be screening in US theaters for 1 night only in October, possibly October 29th. This would be an event similar to the 1 night only anime events that occasionally pop up in theaters. Watch here for more details when/if this gets confirmed. C21Media.net is reporting that "Turtles Forever," the animated movie from 4Kids Entertainment where the different multi-verses of TMNT history team-up to battle the One True Shredder, will screen at the MIPCOM film festival in Cannes, France. No further details are currently available, although the festival runs October 5-9, 2009. As "Turtles Forever" currently has no distribution deal in place, it's likely that the producers are hoping to land one as a result of participating in the festival. If you missed it, you can catch the entire audio of the live screening of "Turtles Forever" at San Diego Comic-Con here. EXCLUSIVE: "Turtles Forever" Complete Audio! Last Friday, July 24, 2009, Mirage Studios hosted a TMNT 25th Anniversary "Galabunga" party as part of San Diego Comic-Con, where, after pizza, cake, and prizes, fans were treated to the premiere screening of "Turtles Forever," a special animated adventure that saw the Turtles of the 4Kids series crossing into the multiverse of the original TMNT cartoon. Shortly before the show started I realized that I had my audio recorder still with me, after utilizing it earlier in the day at the Con. I decided to take a chance and flip it on to see if the audio from the show would come out. I finally got around to checking the audio tonight, and what do you know, it actually turned out really good! This audio is my own personal recording. At no point during the night were we told, either in spoken word or print, that recording was not allowed. As of right now there is no distribution deal for the release of "Turtles Forever" on DVD. This is surely forthcoming, but it can't hurt to raise enthusiasm for the project for potential distributors to see (and hear, in the case of the crowd reaction). If at any point it is requested by Mirage Studios and/or 4Kids Entertainment for the file to be removed from this site, it shall be. This was recorded among a very lively crowd, so there is a lot of crowd noise that sometimes blocks out the audio from the movie. The volume in the room was very loud and my recording device is very basic (and as it was, I hit record as a crap-shoot to see if the audio came out at all), so there is a bit of distortion during the louder parts. With all that said, you can download the audio here. Downloads are limited, so please comment if it needs to be re-uploaded.